«©NCSX»Back in the Spring of 2007, the US Postal Service planted a few hundred R2-D2 mailboxes across the USA in commemoration of the 30th anniversary of Star Wars. There was one in front of the big JAF Post Office in Manhattan which we were tempted to "uproot" from the sidewalk but the local constabulary would've probably given chase. Besides, we weren't inclined to spend time incarcerated with bunkmates not of our own choosing. 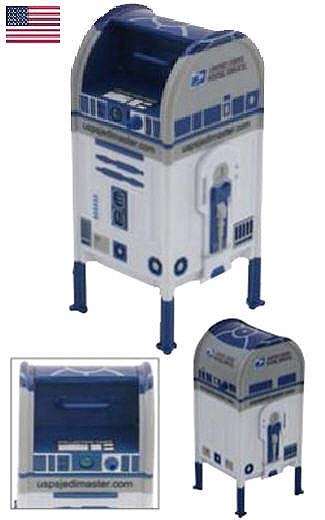 As summer rolls around, we get an R2-D2 mailbox of our very own. Except it's miniature and serves double duty as a Star Wars themed piggy droid bank which holds coins. 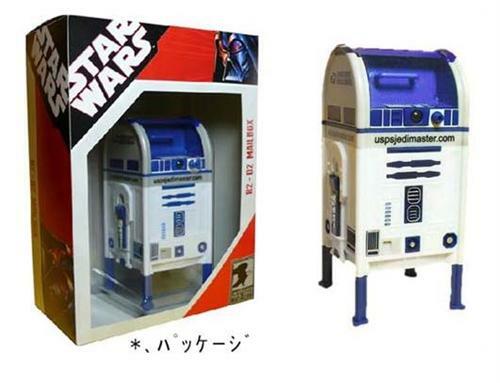 There's no coin-slot on the bank but currency may be dropped inside R2-D2 by pulling on the mailbox door and slipping in dimes, pennies, and nickels. The mailbox measures 16cm (6.29") tall and is made of sturdy PVC with four spindly supporting legs.